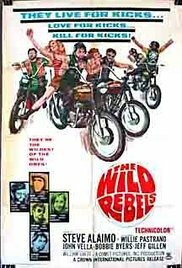 Wild Rebels is a small hidden gem of a film. A super little drive-in style film that probably is better known now due to being included in multi-film bargain packs as opposed to generating buzz from its theatrical run in the late 1960’s. It’s one of those films that is definitely worth seeing if you run across it, especially if you can forgive it’s micro budget. The film is a weird kind of proto version of Point Break with the thrill seeking crooks and a thrill seeking “cop”. While it’s not a an absolute mirror of the Patrick Swayze Keanu Reeves film or its recent remake, it’s close enough that everyone I was watching this with all commented at the similarities and pondering if this is where they stole the idea from. What I like about the film is that there is a strong sense of characters. Yes they are clearly good guys and bad guys but there is a sense of something beyond the typical. You really feel that the bad guys could have been anything they wanted to be, but that the freedom and thrills of being bad guy bikers and thieves suited them best. For me the only real problem is the cheapness. The lack of cash results in some awkward moments at times, largely in the racing sequences where you can tell it’s not a real race and where cars magically go from crashed wrecks to racing infernos in a split second.